Mighty-thewed barbarians and grim mercenaries roam the desolate plains of Ohio. Giant snakes, and those who worship them, prowl the ruins of St. Louis. Pirates battle the Japanese invaders in the South China Sea. Bold British agents, equipped with experimental bio-technology, thwart the insidious infiltration of Stalin's humanzees. Sky-raiders strike from hidden bases in the Sahara, deros skulk in South American caverns, and the Texas Rangers fight electrical death worms to save Los Alamos. Over 20 pages of pure adventure: Four campaign types, each with a sample campaign laid out in nine scenario seeds. A massive Adventure Generator, helping you build every tale from the Hook to the Henchmen to the Twist ending. Four worked examples, taking the Adventure Generator's raw numbers and running with them. 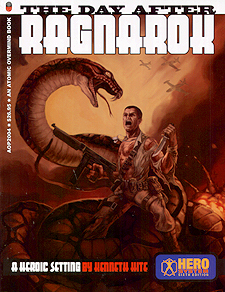 Plus old-school random encounters for the devastated wastelands of America - will you face slave-raiding Klansmen, the terrifying fly-by-night, or a desperate band of escaped Wehrmacht P.O.W.s?